Caption: Mold issues can get out of hand—fast! KIC Restoration is here to help you through the entire process. Regardless if you are keen on obtaining a preliminary residential mold inspection in San Diego, spearheading a commercial mold remediation in Poway or you simply would like an additional bid on an existing mold remediation campaign in La Jolla, we are equipped to help. KIC Restoration is here to solve your mold restoration issues – improving your health and providing an environment by which you can thrive is our main focus. Through our proven and unique Goldmorr powered approach, we can protect not only your health but also the value of your property. Are you worried that your dwelling may be harboring black mold or any other toxic mold? If so, it is imperative you initiate a mold inspection. We traditionally recommend that you contact a restoration company to do the initial mold inspection. Provided the mold inspector or mold technician is credentialed and experienced, they will remain well-equipped to outline your natural next steps. We often find that property owners are keen on initiating scientific mold testing, however, in most cases it provides limited value and is not necessary. That said, sometimes mold testing is completely advisable and in that case, we recommend contacting several companies that performs mold testing exclusively. This is in an effort to mitigate the potential conflict of interest associated with restoration companies that conduct both testing and restoration. We will send you over an updated list of “test only” mold testing labs that we trust and that conduct mold inspections throughout San Diego County. Our list breaks down the suite of mold testing services, the mold inspector’s fee structures and the contact information for several San Diego mold inspectors. 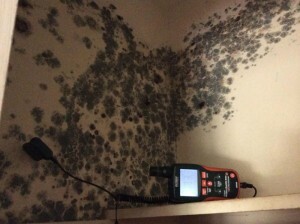 Mold is sneaky­—­ in a damp and or non-ventilated environment mold populations can explode, and in many cases the mold will grow for weeks or even months prior to being visible or overwhelming. Listen to your body. If you are sneezing, getting headaches, having trouble breathing and you feel like your allergies are acting up— this could be mold, and in many cases the very toxic black mold that is common throughout San Diego residential properties. One thing to keep an eye out for is if your allergies (or allergy-like symptoms). If they appear to suddenly get better when you vacate a potentially contaminated area, that is a tell-tale way to identify you have a serious mold problem. Mold remediation that is initiated in a reasonable amount of time can prevent very expensive large-scale restoration of your home or office’s building materials. Our Goldmorr powered approach is compelling because provided we have the opportunity to treat the black mold or other toxic mold in time, then we rarely have to replace the drywall, and often have to replace much less any of the framing or related building materials. This translates to lower overall restoration cost and decreased downtime. Often we have our clients back in their property the same day. Goldmorr products that are applied are registered as non-skin irritants and are quickly biodegradable which mitigates the potential for negative impacts of the chemical fall-out associated with more antiquated approaches to mold restoration. Mold is no doubt dangerous stuff! It is reported to be responsible for a third of indoor airborne allergic reactions. These reactions express themselves through itchy eyes and nose, skin irritations, sinus congestion and it can even contribute to upper respiratory tract infections. Moreover, young children and the elderly are particularly susceptible to asthma attacks brought on by toxic mold. When you make the choice to contract KIC Restoration for your mold remediation projects, you know that you have an experienced team of individuals with the right equipment, the right experience and the right products to get you breathing easy again in the broadest sense. Mold remediation in San Diego is our primary specialty and we will do our absolute best to ensure your home, office or facility is quickly returned to its initial standing. We take pride in our ability to collaborate with insurance adjusters in a way that does not bog down our clients and property owners with these administrative headaches—we have the process mastered and we know that our fee structures are well within the industry standard. In fact, many of our referrals come from insurance agents and happy customers, because not only do we do a complete and thorough job, but we do it quickly and for a supremely fair price.